The 8600Si provides stereo enhancement, equalization, AGC, multiband compression, low-IM peak limiting, stereo encoding, and composite limiting — everything that even the most competitive major market station needs to stand out on the dial. More than 20 excellent sounding, format specific factory presets get you started. You'll find all of your favorite 8500 presets, plus the 8600 "MX" presets designed by Bob Orban and Greg Ogonowski to exploit the exciting possibilities inherent in the 8600Si's peak limiter technology. Although the factory presets are fully competent "out of the box”. You can customize them with easy one-knob LESS-MORE control. Full Control gives you the versatility to customize your audio further. Orban’s Quick setup, which is a guided sequence of screens through the 8600Si‘s setup, is the easiest way to have your station On Air quickly. While this design offers about the same loudness as 8500 processing, its main goal is to make FM analogue broadcasts more competitive with the cleanliness, punch, and open high frequencies of the digital media against which FM analogue transmissions now battle. The FM loudness wars represent 20th-century thinking; in the 21st century, the new competition is digital media. Thanks to its fresh, crisp sound, the 8600Si helps level the playing field between analogue FM and its ever more aggressive digital-only competitors. For Digital Radio broadcasters who prefer using a separate processor for the digital channel, the 8600Si's built-in delay (up to 16 seconds) in the analogue processing path vastly improves installation versatility in HD Radio facilities, freeing you from the need to use the delay line built into the Digital Radio exciter. This allows you to use the 8600Si's built-in stereo encoder and composite limiter to drive the analogue FM transmitter, ensuring no-compromise analogue-channel loudness. The 8600Si’ HD (“Digital Radio”) output is designed to feed streaming, netcasting, and digital satellite or cable radio channels, which can be Eureka 147, DRM, DAB + or the iBiquity® HD Radio system (formerly known as “IBOC”—“In-Band On-Channel”) approved for use in the United States. The equalizer and five-band compressor/limiter in the digital processing chain have their own sets of user-adjustable audio controls that are independent of the controls in the FM analogue transmission chain’s equalizer and five-band compressor/limiter. The bottom line? Processing that optimizes the sound of your FM channel while punching remarkably crisp, clean, CD-like audio through to your digital channel audience. The digital radio and analogue radio processing chains offer ITU-R BS.1770-3+ Loudness Meters and Safety Limiters for use in countries that enforce a BS.1770 loudness limit on digital and/or analogue radio broadcasts. The 8600Si implements “true peak control” in the HD processing chain by oversampling the HD peak limiter’s sidechain at 256 kHz. This allows the 8600Si to prevent clipping in a playback device’s analogue signal path by predicting and controlling the analogue peak level follow the playback device’s reconstruction filter to an accuracy of better than 0.5 dB. For typical program material, accuracy is 0.2 dB. Without true peak control, analogue clipping can occur even if all peak values of the digital samples are below 0 dBFS. This phenomenon has also been termed “0 dBFS+.” Thanks to true peak control, sample rate conversion, unless it removes high frequency program energy or introduces group delay distortion, cannot cause sample peaks to increase more than 0.5 dB. The stereo encoder’s stereo sub-channel modulator can operate in normal double sideband mode (DSB) and in an experimental compatible single sideband mode (SSB) that is offered to enable users to compare and assess the two modes. Users who are required to comply with the ITU-R BS.412 multiplex power limits should note that SSB operation puts 3 dB more power into the stereo sub-channel than conventional DSB operation does. The 8600Si’s built-in ITU-R MPX Power Controller automatically compensates for this increase. The 8600Si includes a “ratings encoder loop-through” connection. This allows a ratings encoder with an AES3 digital input and output to be inserted between the output of the AGC before the analogue-FM and HD processing paths split or between the output of the audio processing and the input to the stereo encoder. This keeps the audio level driving the ratings encoder as high as possible, minimizing the number of “low audio level” alarms that the ratings encoder generates. A 10 MHz frequency reference input allows the stereo pilot tone frequency to be locked to GPS or another high-accuracy frequency standard. This improves the performance of single-frequency networks in areas where coverage of the transmitters overlaps. Analogue Fallback to Digital control that allows Silence Sense to switch the active input from Analogue to Digital if silence is detected in the analogue input signal but not on the digital input signal. This function works vice versa as well on both analogue and digital AES input. The silence sense parameters apply to both simultaneously and both detectors are available to drive the 8600Si’s tally outputs and sending SNMP Traps/Alerts. The 8600Si includes a full-featured RBS/RBDS generator at no additional charge. The generator supports dynamic PS. It can be controlled via 8600S presets and an ASCII terminal server that can be connected to automation to support displaying title and artist. Ethernet connectivity is standard, as is an easy to use PC remote control application that runs on Windows 2000, XP, Vista, 7, 8, 8.1 and 10 that can control many 8600Si’s on a TCP/IP network. 8600Si PC Remote software allows you to access all 8600Si features and allows you to archive and restore presets, automation lists, and system setups (containing I/O levels, digital word lengths, GPI functional assignments, etc.). In addition, programmable contact-closure (GPI) control plus ACSII terminal control via the 8600Si's RS232 serial and Ethernet ports and give you total freedom to interface the 8600Si with your facility's remote control infrastructure, whatever it might be. The SNMP (Simple Network Management Protocol) features allow you to monitor your Optimod’s status and to send Alarm notifications via your Optimod’s Ethernet connection to your network. The API interface allows you to use custom third-party applications (including automation systems) to recall presets, view status and set the controls. Suitable for any digital transmission channel (such as DAB+, netcasts and HD Radio) that does not use pre-emphasis, the 8600Si Digital Radio processing chain offers an ITU-R BS.1770-3 Loudness Meter and Loudness Controller for use in countries that enforce a BS.1770 loudness limit on digital radio broadcasts. The 8600Si implements "true peak" control in the HD processing chain by oversampling the HD peak limiter's sidechain at 256 kHz, which exceeds the recommendations in ITU-R BS.1770 for “true peak” metering. This allows the 8600Si to prevent clipping in a playback device's analogue signal path by predicting and controlling the analogue peak level follow the playback device's reconstruction filter to an accuracy of better than 0.5 dB. For typical program material, accuracy is 0.2 dB. Without true peak control, analogue clipping can occur even if all peak values of the digital samples are below 0 dBFS. This phenomenon has also been termed "0 dBFS+." Thanks to true peak control, sample rate conversion, unless it removes high frequency program energy or introduces group delay distortion, cannot cause sample peaks to increase more than 0.5 dB. The HD Radio system generates a digital carrier that shares a given station’s allocated bandwidth with the analogue FM carrier. The receiver crossfades between the analogue and digital channels to minimize the effect of RF dropouts. This scheme requires audio processing for the two channels to be closely matched in texture to ensure that the receiver’s crossfades are seamless. Optimum peak limiting for the two channels is very different. The analogue channel requires state-of-the-art pre-emphasis limiting to achieve competitive loudness and minimize pre-emphasis-induced high frequency loss. The digital channel, on the other hand, has no pre-emphasis but is heavily bit-reduced with the HDC perceptual codec. The highest available rate is 96 kbps and many broadcasters are now multicasting with two 48 kbps channels. This limited bitrate creates an entirely different set of requirements: the peak limiting must not use clipping because there is no bit budget available to encode clipping-induced distortion products. However, pre-emphasis limiting is unnecessary. The best technology for peak limiting the digital channel is look-ahead limiting, which can perform very clean peak reduction on flat channels, but which is unsuitable for pre-emphasized channels. OPTIMOD-FM 8600Si is an excellent solution to his dilemma because its AGC and stereo enhancement are shared between the two channels, while equalization, multiband compression/limiting and peak limiting are independent. The analogue FM path provides the improved MX peak limiter, overshoot compensation, stereo encoding, and composite limiting using Orban’s patented “Half-Cosine Interpolation” algorithm. The peak limiting is anti-aliased and uses sample-rates as high as 512 kHz. Meanwhile, the HD output receives low-IM look-ahead peak limiting, which we improved in the 8600Si to exploit some of the same new technology we designed for the FM analogue processing chain. This look-ahead limiting is optimized to make the most of the limited bitrate codecs used digital radio and netcasting channels. By eschewing any clipping, the HD processing prevents the codec from wasting precious bits encoding clipping distortion products, allowing the codec to use its entire bit budget to encode the desired program material. For convenience, it is possible to couple the equalizer, HF enhancer and multiband compressor/limiter setup controls of the two paths, allowing them to be matched easily. This is useful in HD Radio installations where the station’s goal is to minimize the audibility of analogue/digital crossfades at the receiver. However, the ability to adjust the analogue FM and digital radio paths separately allows users more latitude to fine-tune their audio. For example, a broadcaster who believes that selling the advantages of HD Radio to the public requires an obvious, audible difference between the analogue FM and digital channels can generate this “wow!” factor. Dual-path processing also allows the digital media processing to be independently tuned to minimize artifacts in low bitrate codecs, like those used in netcasting and HD Radio. A built-in diversity delay of up to 16 seconds in the analogue processing path simplifies installation in HD Radio facilities, freeing you from the need to use the delay line built into the HD Radio exciter. This allows you to use the 8600Si’ built-in stereo encoder and composite limiter to drive the analogue FM transmitter, ensuring no-compromise analogue- channel loudness. The diversity delay can be applied independently to any output emitting the analogue-FM processing signal, so some outputs can be delayed while others are not. In addition to be adjustable via 8600Si PC Remote software, the diversity delay can also be adjusted remotely via the 8600Si’s control API or SNMP. This provides “hooks” that allow a compatible third-party HD monitor receiver to automatically achieve exact delay matching at the receiver by measuring the delay and correcting it as necessary.The 8600Si’s 64 kHz base sample rate allows it to provide up to 20 kHz audio bandwidth at its HD output. The HD bandwidth is user-settable between 15 and 20 kHz to optimize the processing for the codec employed in the digital chain. Many low bitrate codecs operate better when fed 15 kHz audio because this enables them to use their available bit bandwidth most efficiently. This is particularly true for low rates, like 32 kbps. However, at higher sample rates, full 20 kHz bandwidth provides the same bandwidth as typical source material, so the user may prefer to use it for these higher rates. Although the 8600Si’ new peak limiter technology has narrowed the gap, the 8600Si’s digital output still sounds cleaner and more open than its FM output, particularly in the high frequencies — the analogue channel is inevitably handicapped by the standard 50 and 75 microsecond pre-emphasis curves, which compromise its high frequency headroom. Using program material, we’ve measured as much a 9 dB difference in favor of the digital channel at high frequencies! Even after the processed passes through the codec, a significant amount of this audible superiority remains. Most HD Radio exciters require 44.1 kHz AES/EBU audio streams for both their analogue-FM and digital inputs. The sample rates for both streams must be identical and must be locked to an external reference. This requires two AES/EBU outputs from a single-box processor. Because the output sample-rate on either or both of the 8600Si’ AES3 outputs can be locked to either the 8600Si’ sync reference input or to its AES3 input, the 8600Si fully meets the requirements. Moreover, because of the 8600Si’s built-in diversity delay on the analogue-FM channel, it is possible (and usually desirable) to entirely bypass the analogue-FM side of the HD Radio exciter and to use the 8600Si’ built-in stereo encoder and composite limiter to drive the analogue FM exciter directly. -An LCD and full-time LED meters make setup, adjustment and programming of OPTIMOD-FM easy - you can always see the metering while you are adjusting the processor. Navigation is by dedicated buttons, soft buttons (whose functions are context-sensitive), and a large rotary knob. The LED’s show all metering functions of the processing structure (Two-Band or Five-Band) in use. -The 8600Si provides universal transmitter protection and audio processing for FM broadcast. It can be configured to interface ideally with any commonly found transmission system in the world, analogue or digital. -The 8600Si provides pre-emphasis limiting for the internationally used pre- emphasis curves of 50μs and 75μs. Compared to its predecessor, its new clipping/pre-emphasis control technology preserves 2.5 to 3 dB more frequency energy while significantly reducing audible clipping distortion at all frequencies. This produces a clean, open sound whose subjective brightness more closely matches the original program. -The 8600Si achieves extremely tight peak control at all its outputs—analogue, AES3 (for both the analogue FM and HD channels), and composite baseband. -The stereo encoder has two outputs with independent level controls, each capable of driving 75Ω in parallel with 47,000pF, (100ft / 30m of coaxial cable). -By integrating the stereo encoder with the audio processing, the 8600Si eliminates the overshoot problems that waste valuable modulation in traditional external encoders. -The 8600Si prevents aliasing distortion in subsequent stereo encoders or trans- mission links by providing bandwidth limiting and overshoot compensated 15 kHz low-pass filters ahead of the 8600S’s audio outputs and stereo encoder. -The 8600Si has an internal, DSP-based stereo encoder (with a patented “half-cosine interpolation” composite limiter operating at 512 kHz sample rate) to generate the pilot tone stereo baseband signal and control its peak level. The composite limiter is a unique, “you can only do this in DSP” process that beats composite clippers by preserving stereo imaging while fully protecting the stereo pilot tone, RDS/RBDS, and subcarriers. The stereo encoder’s stereo sub-channel modulator can operate in normal double sideband mode and in an experimental compatible single sideband mode that is offered to enable users to compare and assess the two modes. -The Digital Radio and analogue radio processing chains offer ITU-R BS.1770-3+ Loudness Meters and Safety Limiters for use in countries that enforce a BS.1770 loudness limit on digital and/or analogue radio broadcasts. -The 8600Si implements “true peak” control in its HD processing chain by oversampling the HD peak limiter’s sidechain at 256 kHz. This allows the 8600 to prevent clipping in a playback device’s analogue signal pathby predicting and controlling the analogue peak level following the playback device’s reconstruction filter to an accuracy of better than 0.5 dB. For typical program material, accuracy is 0.2 dB. -Without true peak control, analogue clipping can occur even if all peak values of the digital samples are below 0 dBFS. This phenomenon has also been termed “0 dBFS+.” Thanks to true peak control, sample rate conversion, unless it removes high frequency program energy or introduces group delay distortion, cannot cause sample peaks to increase more than 0.5 dB. For example, sample rate conversion from 48 kHz to 44.1 kHz is highly unlikely to cause sample peak clipping in the 44.1 kHz audio data. -A built-in RDS/RBDS encoder supports the most important RDS features and can be associated with processing presets so that mixed-format stations can automatically update the “program type” field to complement the programming by recalling a audio processing preset for a given program type. -OPTIMOD-FM 8600Si is supplied with analog and AES3 digital inputs and outputs. The digital input and the two digital outputs are equipped with samplerate converters and can operate at 32 kHz, 44.1 kHz, 48 kHz, 88.1 kHz, and 96 kHz sample rates. The pre-emphasis status and output levels are separately adjustable for the analog and digital outputs. Each output can emit the analog FM processed signal, the analog FM processed signal with diversity delay applied, the digital radio processed signal, or the low-delay monitor signal. -A loop-through connection is provided to enable a ratings encoder (such as Arbitron®) to be inserted between the output of the audio processing and the input to the stereo encoder. . In “ratings encoder loop-through mode,” the second digital output drives the ratings encoder from the output of the FM processing. -Failsafe switching detects loss of audio on the primary input, which you can assign to be the analog or digital input. If audio is lost on the primary input, the 8600Si can switch automatically to the secondary input. 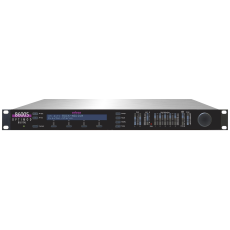 -The 8600Si has two independent equalizers, multiband compressors, and peak limiters for the FM analog and digital media processing channels, allowing you to separately optimize the processing for each. -An AES11 sync input allows you to synchronize the output sample rate of either (or both) AES3 outputs to this input. You can also synchronize the outputs to the AES3 digital input or to 8600Si’s internal clock. The sync source of each AES3 output is independently selectable. -A defeatable diversity delay can delay the FM analog processing output up to 16.2 seconds. Delay can be trimmed in intervals of one sample of 64 kHz to match the analog and digital paths in the HD Radio system, eliminating the need to use the delay built into the HD Radio exciter and permitting the 8600Si’s internal stereo encoder and composite limiter to drive the analog FM exciter. Each output (Analog, Digital 1, Digital 2, Composite) can be independently configured to emit the delayed or non delayed signal. -The analogue inputs are transformerless, balanced 10kΩ instrumentation- amplifier circuits. The analog outputs are transformerless balanced and floating (with 50Ω impedance) to ensure highest transparency and accurate pulse response. -The 8600Si has two independent composite baseband outputs with digitally programmable output levels. Robust line drivers enable them to drive 100 feet of RG-59 coaxial cable without audible performance degradation. -The 8600Si’s two subcarrier inputs are mixed with the output of the 8600S’s stereo encoder before application to the composite output connectors. One in- put can be re-jumpered to provide a 19 kHz pilot reference output. Both inputs have internal level trims to accommodate subcarrier generators with output levels as low as 220 mV. -The 8600Si precisely controls the audio bandwidth of its analog FM processing to 16.5 kHz. This prevents significant overshoots in uncompressed digital links operating at a 44.1 kHz-sample rate or higher and prevents interference to the pilot tone and RDS (or RBDS) subcarrier. The bandwidth of the 8600Si’s digital radio output is adjustable in 1 kHz increments between 15 kHz and 20 kHz. -The 8600Si has a defeatable multiplex power limiter that controls the multiplex power to ITU-R BS412 standards. An adjustable threshold allows a station to achieve maximum legal multiplex power even if the downstream transmission system introduces peak overshoots into the 8600S-processed signal. Because this limiter closes a feedback loop around the audio processing, it allows the user to adjust the processor’s subjective setup controls freely without violating BS412 limits, regardless of program material. The multiplex power limiter acts on all outputs (not just the composite output). In its most common configuration, it reduces clipper drive when it reduces power, simultaneously reducing clipping distortion. However, to accommodate customers who wish to use heavier clipping to achieve a certain sound, the MPX power controller can be configured to reduce gain after the clippers. -The 8600Si is designed and certified to meet all applicable international safety and emissions standards. -A processing structure is a program that operates as a complete audio processing system. The 8600Si realizes its processing structures as a series of high- speed mathematical computations made by Digital Signal Processing (DSP) chips. -The 8600Si features six processing structures. Four of these are the same as Optimod-FM 8500: Five-Band (or “Multiband”) for a consistent, “processed” sound with 17 ms delay (typical), free from undesirable side effects, Low-Latency Five-Band (12 ms delay), Ultra-Low-Latency Five-Band (3.7 ms delay), and Two-Band (17 or 22 ms delay) for a transparent sound that preserves the frequency balance of the original program material. A special Two-Band preset creates a no-compromise “Protect” function that is functionally similar to the “Protect” structures in earlier Orban digital processors. -The 8600Si’s two “MX” structures (five-band and two-band) are similar to their 8500 counterparts except that they use the 8600S’s new peak limiting technology to decrease distortion while achieving substantial improvements in transient punch and high frequency clarity. This advanced technology requires more input-to-output delay than the older structures, so it is impractical for talent to monitor these structures off-air with headphones The 8600Si offers a special low-delay monitor output for this purpose. -The 8600Si can increase the density and loudness of the program material by multiband compression, limiting, and clipping—improving the consistency of the station’s sound and increasing loudness and definition remarkably, without producing unpleasant side effects. -The 8600Si rides gain over an adjustable range of up to 25 dB, compressing dynamic range and compensating for both operator gain-riding errors and gain in- consistencies in automated systems. -The 8600Si’s Two-Band processing structures can be made phase-linear to maximize audible transparency. -The 8600Si can be remote-controlled by 5-12V pulses applied to eight programmable, optically-isolated “general-purpose interface” (GPI) ports available at the REMOTE INTERFACE connector on the rear panel. -8600Si PC Remote software is a graphical application that runs under Windows 2000/XP/Vista/7/8/8.1 and 10. It communicates with a given 8600S via TCP/IP over modem, direct serial, and Ethernet connections. You can configure PC Remote to switch between many 8600Sis via a convenient organizer that supports giving any 8600Si an alias and grouping multiple 8600Sis into folders. Clicking a 8600Si’s icon causes PC Remote to connect to that 8600Si through an Ethernet network, or initiates a Windows Dial-Up or Direct Cable Connection if appropriate. The PC Remote software allows the user to access all 8600Si features (including advanced controls not available from the 8600Si’s front panel), and allows the user to archive and restore presets, automation lists, and system setups (containing I/O levels, digital word lengths, GPI functional assignments, etc.). -The 8600Si contains a versatile real-time clock, which allows automation of various events (including recalling presets) at pre-programmed times. The clock can be set automatically from an Internet timeserver. -A Bypass Test Mode can be invoked locally, by remote control (from either the 8600Si’s GPI port or the 8600Si PC Remote application), or by automation to permit broadcast system test and alignment or “proof of performance” tests. -Silence alarm and digital audio fault tally outputs are available. -The 8600Si contains a built-in line-up tone generator, facilitating quick and accurate level setting in any system. -The 8600Si's software can be upgraded by running Orban-supplied downloadable upgrade software on a PC. The upgrade can occur remotely through the 8600Si’s Ethernet port or serial port (connected to an external modem), or locally (by connecting a Windows® computer to the 8600Si’s serial port through the supplied null modem cable).